Rob Writz, Backcountry Skiing Berthoud Pass Colorado guidebook author. Rob Writz began skiing and snowboarding as a teenager in Western Canada and then learned how to hold an edge on the mountains of New Hampshire and Vermont. He has an insatiable desire to discover, and has been exploring Colorado’s Front Range for over two decades. 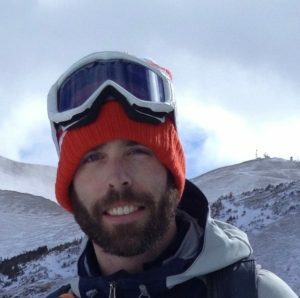 Rob is the creator of Front Range Ski Mountaineering, an online resource describing the winter backcountry skiing and spring ski mountaineering of Colorado’s Front Range mountains. His backcountry partners do not describe him as the quickest uphill, nor as the most stylish downhill, but they love how he shows up every time ready for more.